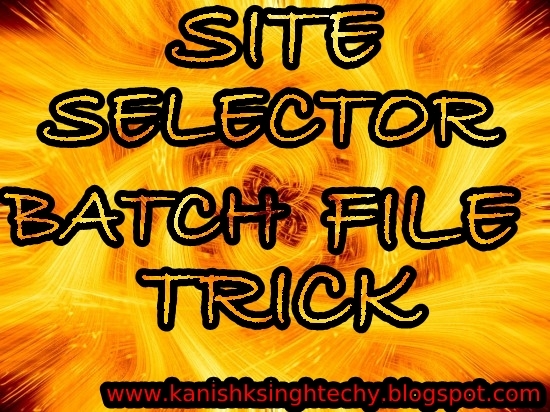 Site Selector Batch File Trick. | Kanishk's Technical Blog. Site Selector Batch File Trick. Hello Friends,Once again I am back with my Batch File Tricks. This Time its Something New. By Using this Batch File,You can directly press the selected number of site and Boom! There opens a Website. Note: The File name must end with a .bat extension. echo Type [e] to exit or [b] to go back and select another site. After you save the Notepad File as Site Selector.bat Excute it and the screen Shown above will Come. Tip: After Saving this File.Paste a Shorcut of it on your Desktop so that everytime you wanna visit your favourite site,You don't have it Wait. Posted in Batch file trick, Site Shortcut Trick.